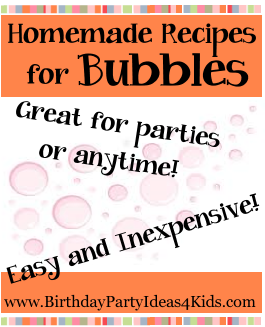 We’ve added Homemade Bubble recipes to the Birthday Party Ideas 4 Kids website! There are 4 great recipes that are easy and inexpensive for blowing bubbles. Make up a big batch for a birthday party or anytime! All the recipes use cheap items that you probably already have in your kitchen. After you make up a batch of the blowing bubbles recipe take a look at our Bubble Games and Activity page on the website! We’ve listed our favorite games and activities to play with bubbles. Great for kids of all ages! What are your favorite games to play with bubbles? Birthday Party Ideas 4 Kids … Let’s get the party started!